Each new prom season always presents many options: new dress trends, new styles, new colors. 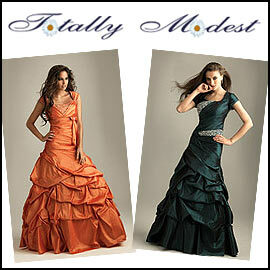 You need not think of modest prom dresses as one particular style. Totally Modest, a dress company based in St. George, Utah, presents many stunning modest prom gown designs, all of which have a very contemporary appearance. The company offers many different materials and embellishments: lacework, rhinestones, tulle skirts, silky taffeta, aurora taffeta and more. Many of the colors are also eye-catching: olive, copper, chocolate, pink, aqua, turquoise, ivory, teal and more. In addition to prom dresses, Totally Modest also offers some smart-looking handbags, as well as jewelry, shoes, wedding gowns and more.